Just to the north of Trinsic, through the swamps. 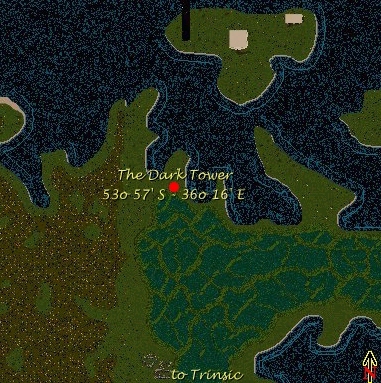 History: The Dark Tower stands along the edge of the swamps just to the north of Trinsic. Its mere presence is erie enough from the outside, let alone should ye enter its ominous doors. Skeletons litter the steps should ye work the courage to walk close enough and see if anyone is home. The inside boasts just as uninviting as the outside does. Assorted treasures lay all around, but out of arms reach, which is good for those who would dare try and steal something from this place would surely meet their maker should anything be disturbed. I walked around as quietly as possible and could feel the staring eyes of unseen hosts. I would have stayed longer, but my horse did nay like the confines and tried to bolt on me several times while inside the tower so I took it as a suggestion to leave as quickly as I could. 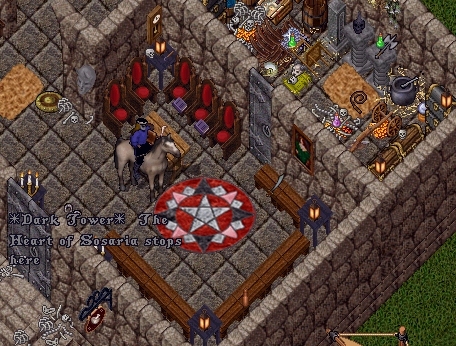 Here’s a bit of trivia that is little known and probably not wanting to be admitted by owners of the Bard and Healer: It is said by a reliable source that their establishment, the tower that houses the Bard and Healer was the Original home of the Dark Tower several years ago, during the reign and terrorization of the Seer RPC troll known as the Dark One.When the Dark Tower was first conceived, it was housed at the tower now known as the Bard and Healer. Evidentally, theres alot of role playing history of the DT and other guilds there and that evil ‘events’ and ‘rituals’ took place within its walls. The Dark Tower was moved about two years ago to where it stands now.